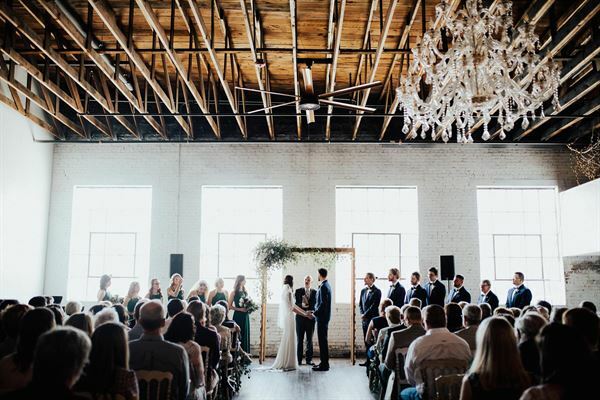 We are a wedding and reception venue that has transformed a 1920's Chevy dealership in the heart of downtown Siloam Springs, recognized on the National Register of Historic Places. An elegant industrial venue that is so remarkable & affordable, we guarantee your wedding day will stand out from all the rest. Standing room accommodates around 800, seated 400, that means NO flipping for your guests at your weddings! Be a part of our story as this historic building takes on new life and the beginning of many new relationships. 20% down to hold date, rest of amount due 30 days prior to booked date. 20% down to hold date, the rest is due 30 days prior to booked date. Special Features: Booking includes - Bar area, bridal suite, separate catering space & entrance, large enough to set up wedding and reception, linens for guest tables, tables and 300 wood chairs.